It is everywhere in the news. And of course, it was only a matter of time before it showed up here. Now if you’ve read any of the articles surrounding this event, you may have turned away immediately. The articles are filled with technical terms, and concepts which are difficult for us mere mortals to wrap our minds around. But here is a play by play breakdown for those of you gamey enough to read my take on things. Black holes are creepy. At least I think so. They seem a little vague, and quite possibly dubious. But do not fear, the smarty scientists tell us. They say those holes are condensed leftovers from a massive, massive star. Not like Beyonce’, or JayLo, but like Starlight, Starbright, First Star I See Tonight. Anyway, when a gargantuan star goes kaput, the core of the star collapses. And that is how the black hole comes to be. And the black hole’s gravity is so strong, that nothing, nothing, nothing can escape its pull. Not even light. Hence the name. Black. Here’s the other thing that is hard to come to terms with. That picture of the neon donut we’ve been seeing on every news source? Well. That is 53 million light-years away. So what we’re seeing is pretty much what happened at the black hole, 53 million years ago. I can’t even remember lunch on Wednesday. So 53 million years seems like a real stretch for me. There are a couple of other items of note. I think Albert Einstein was beyond brilliant. We get these people on earth every few hundred years, or so. Like Leonard DaVinci, and such. At any rate. This photo of the Black Hole helps confirm Einstein’s general relativity theory. Which is big dang news. Einstein — a century ago — predicted this exact symmetrical shape that scientists just found. Way to bring it, Big Al. E=mc2. Everyone, hold up their lit Bic Lighters with me. And then there was the woman who made it possible. Her name is Katie Bouman. (Do you think it is pronounced Boooo-man or like, Bow-man?). No matter. (That was a joke — no matter. There is no matter in a Black Hole.). Nevermind, back to Bouman. She came up with the algorithm. Yes. 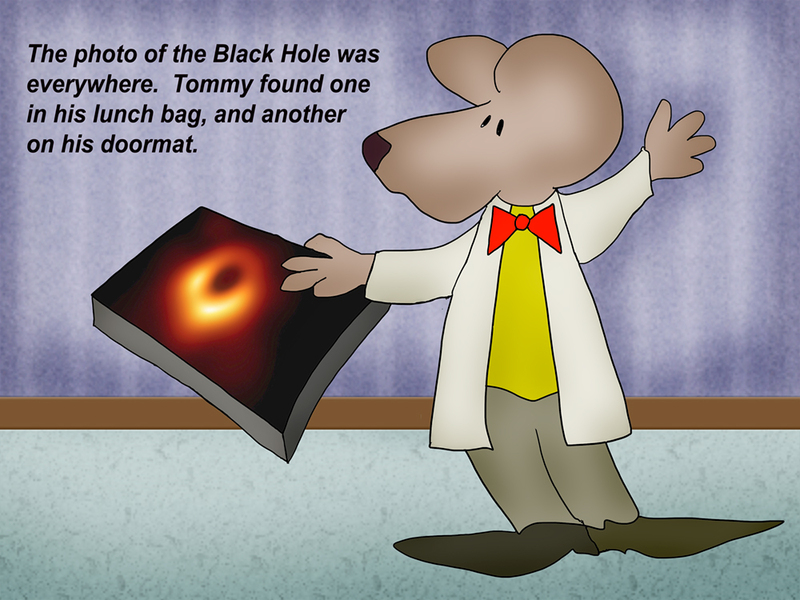 They needed a heady-math-equation to get the Event Horizon Telescope to take a photo of the black hole. It is not like a point and shoot camera. No. They need some serious figuring to take a photo that is 55 million light years away and that has a mass 6.5 billion times that of the sun. It was sort of like putting together a puzzle of telescopes. The algorithm, stitched together data collected from radio telescopes positioned across the globe. And that’s what made the final neon orange donut image. Our newly photogenic black hole out yonder. Way up in the sky. And that is the brief synopsis. Holes in general can be a bit of a thing, though. Most of the time they are problematic. Holes in roofs. Holes in boats. Those little black holes which exist in most shower and bathtub drains. These are especially creepy to me. I don’t really want to know what is down there. But on the other hand, I think I would feel better if I “knew” what was down there. I mean, we are all pretty vulnerable in the shower, being all nakers, and all. Any hole anywhere is cause for suspicion if you ask me. For instance. A hole has been found in the nudist camp wall. The police are looking into it. And then there was my friend. She dug a hole in my backyard and filled it with water. I thought she meant well.